Caterpillar launches a wheel loader that stands out from the previous models with an increased capacity (+25 %). This machine is called the 990K Aggregate Handler. The machine is equipped with a Cat C27 engine developping 521 kW. Different systems optimise the fuel consumption such as the automatic shutdown of the engine and the auto-resume system. Other systems will improve the transmission, loading and driving of the machine. The driving comfort has also been improved. In the cab, a feature helps adjusting depending on the operator that is driving the machine. The machine is also equipped with a chronometer and a loading control system. In terms of safety, the area at the back of the machine is watched by a camera that can be seen in the cab. 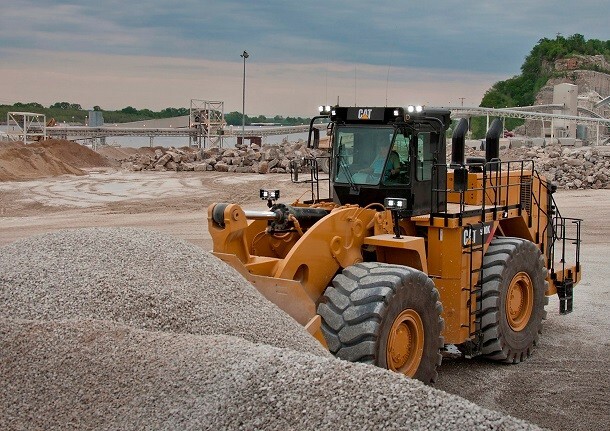 The Cat Connect option can also complete this by adding a radar detection and alert systems. The machine's stability is ensured by an adapted counterweight. The design choices renders this loader completely operational for aggregate management. The manufacturer advises against its use in quarries.